T-minus 10 days and counting! Yellowstone National Park will close to fishing next Sunday, November 4th marking the unofficial end to the 2018 season for us in Yellowstone Country. Last year Justin and the shop staff were forced to hike into the Park to make their final casts of the season as fresh snow and bitter temps closed the park roads to all traffic. This year looks a bit more hospitable. The upcoming forecast calls for typical late fall weather with warm temps through the weekend and cooler wetter weather for the final week. After a week of sunny skies and unseasonably warm temps, we lucked into a good scuzzy day yesterday prompting bugs and fish alike to step up their respective games. Previously, bright conditions limited migratory fish activity to the early morning and late evening hours, and stymied afternoon hatches. All it took was one gray, wet day to get things kicked back into gear, and we have our fingers crossed for a few more of these before it’s over. As the days get colder and shorter, so too does the bite window on our area fisheries. Migratory fish will still be active during the cold mornings and evenings, but all other fish activity will be limited to the warmer afternoon hours. As has been the case all fall, scuzzy days will produce more active migratory fish and stronger afternoon hatches of Baetis mayflies. So, be sure to take advantage of those days when we get them during this final week of the season. Read on to see our take on this week’s fishing, and check out the links below to stay current on area forecasts and flows. Stay tuned as we report each week on hatches, flows, weather, and more. For the most up to date info stop by the shop, give us a call, or drop us a line. As we slide into the final week of the season in YNP there is a noticeable change around town and in the Park. Not only does the fishing season close, but road access through the West gate and most of the park’s interior closes as well. Shops and restaurants are closing down, streets and sidewalks are finally emptying out, and park road signs are changing to address snow machines and snow coaches instead of tour buses and cars. We have our fingers crossed for some more seasonable weather during the final week. While last week’s weather was gorgeous, we had enough sun and 70 degree temps this summer. Now it’s time to welcome in the end of the fishing year and the beginning of the off season with some crummy weather. Look to the old standbys like the Firehole and the Madison to provide some of the last opportunities of the 2018 season, but don’t forget about the Gallatin in the park which was closed for most of the summer season due to wildfire activity. The Gallatin is now open to fishing access and has a healthy population of brown trout as well as the possibility of strong Baetis mayfly hatches in the afternoons, both key ingredients to successful fall fishing. The “Fifty Mile Riffle”, in particular the walk-wade water between Quake Lake and Lyons Bridge, produced some good late season fishing this past week. Nymph fishing during the late morning and afternoon hours was strong, and selective fish fed on the surface in the sneakiest of spots despite the bright skies. Weather conditions look good here through the weekend and into early next week. Afterwards, colder temps are in the forecast and that may slow things down a bit. Unlike the waters in YNP, the Madison remains open to angling through the winter. While the regulations allow for fishing, Mother Nature does her best to limit opportunities and give the fishery a much needed rest. When afternoon highs start to dip down into the 30’s the river slowly shifts into a season of dormancy. Fish occupy deep, slow moving winter runs and pools, and bug activity grinds to a halt. So, take advantage of these last warm days, and try to find a few more opportunities with sporty trout on the Madison. With the season winding down the BSA crew has finished their fall migration to the Missouri and settled back into home waters around West Yellowstone. Joe, Jon, Hoovie, and Earl all had several great weeks of trips. Our handful of resident Missouri River experts like Greg Falls remain up on the Mo to finish out the season, and are enjoying some beautiful conditions for late October. Nymph, Dry, and Streamer games are all still productive, and the crowds are minimal. If you’re in the area, get in on the fun while you still can. Old Man Winter is knocking at the door. 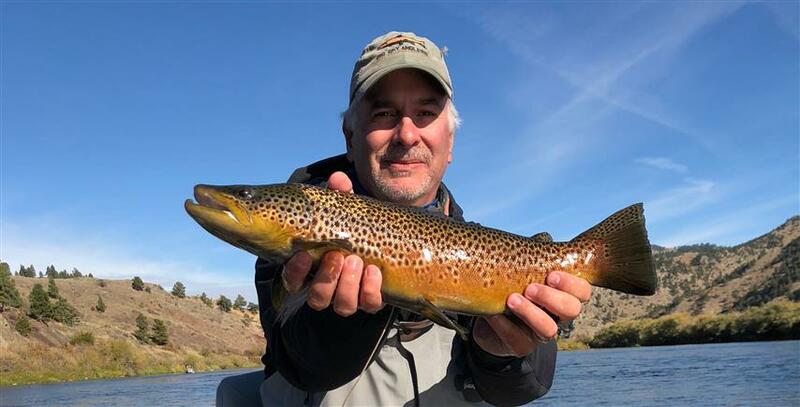 While opportunities in the Yellowstone caldera are winding down, we still have another month of fishing available in the neighboring caldera over on the Railroad Ranch section of the Henry’s Fork. Baetis mayflies and midges can bring Ranch rainbows to the surface for a few hours each afternoon. There’s no guarantees on the Ranch. Some areas will produce good bugs on certain days and not on others, but persistence pays off. So, if conditions are good for a Baetis hatch and you’re not seeing bugs, or rising fish, don’t be afraid to take a little walk or try a new section. Odds are good that it’s happening somewhere. The icy grip of winter is slowly tightening around the high country, but down in the Snake River Plain conditions are slightly warmer. This area around Ashton, ID is generally one of the first to start fishing well in the spring and it’s also one of the last to be fishing well in the fall. The lower Henry’s Fork, above and below Ashton, can have some great baetis hatches well into November, and weather conditions are often more comfortable here than they are up in the high country around West Yellowstone and Island Park. Streamer fishing for the lower river’s resident brown trout can also be exciting this time of year. Though, as we roll into November, be aware of spawning activity, and do your best to avoid spawning areas. These brutes deserve a break by this point in the fall, and the better we treat them now, the better they will treat us next spring and summer during dry fly season.